everyday memories: CC Review game "Bang"
I am not the originator of this game, by any means. I've seen it here and there, on pinterest, various blogs, all similar in form and fashion. It can be specified to whatever subject you'd like. I purchased colored craft sticks (guess where? Yep, $ store) and didn't even use 3/4 of the package. I need to put in some un-colored sticks for one more subject since the pack only came with six. Like my other games I wrote the subject initial and week on my sticks. One subject per color. Also on one stick of each color I wrote "Bang". You'll see next to the sticks I have an Easter sock. No, not just random laundry laying around, though that'd be common. 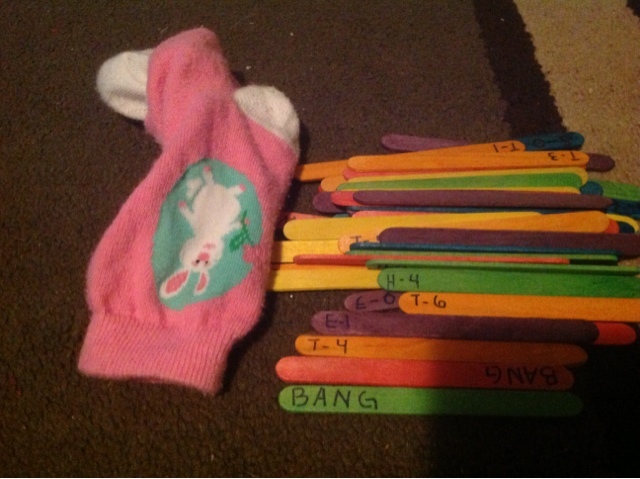 Place your sticks in your random sock for storage, and it hides the sticks while the kids pick them. Game as follows: kid pick a stick, answer the question for the subject and week written on the stick. Next kid follows this pattern until someone pulls a "bang". Then you count the sticks that you accumulated and write down how many you got correct before the "explosion". Start over with the sticks that remain in the sock and see if you can get a higher total. Do you write down a total number of all the kids' sticks on the white board or does each student write down their own personal number? If they write down their own number, do you give them post it notes or something to write their number on? You don't take score, per say. You keep pulling sticks and see how many you can get correct before you pull a bang. I guess older kids could keep score. This way seems simple. Just see how many before you have to put them back. I guess you could keep score. I would do it as a collective class effort instead of individual. Once again just for simplicity. What about the weeks you haven't gotten to yet? We are only in week 5 at the moment, so do you take out all future weeks to review the previous weeks? Yes, Just have in enough to match the week you are on. They are labeled "H - 1" for History minus 1, or History one week ago. I didn't want them to be so specific that I could only use them on a certain week. Labeling them in this way allows me to use them at anytime. but, yes, if you only have 5 wks you will take out all the "-6" sticks.